EZTrader are no longer operating on a sound financial footing and should be avoided. Review our list of brokers to find an alternative broker. 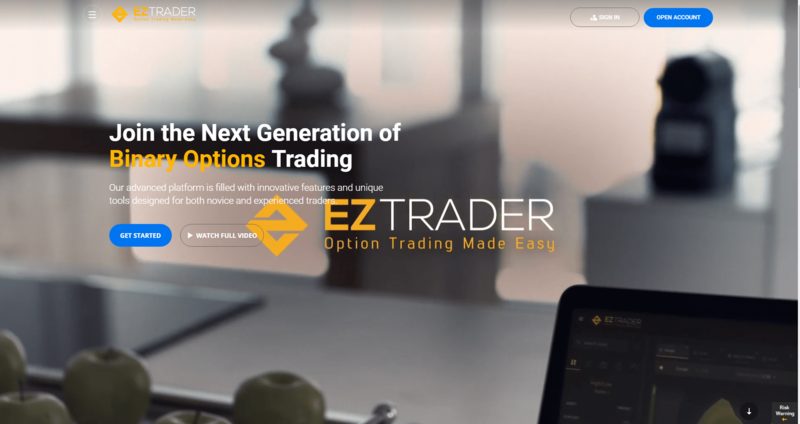 EZTrader were one of the first binary options brokers, when they began operating in 2008. They are now based in Cyprus (and regulated by CySec) and continue to develop their own bespoke trading platform. 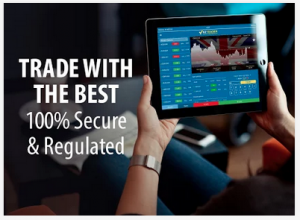 Their in-house development of their own trading platform has enabled them to remain a world leader among binary options firms, by ensuring they always improve their offering. EZ Trader take great pride in operating on their own platform, and also in their customer service. EZTrader have a long established link with football – They are major partners of Bayer Leverkusen, Wolfsburg, Tottenham, and AIK. They have also been involved with Grand National and Wimbledon, expanding their sponsorship ties. This also benefits traders, as EZTrader run promotions and competitions involving match tickets and signed merchandise. Visit the site and search ‘EZTraderFC’ for details. EZtrader have a slick, slim user interface within their trading area, that makes trading EZ(!) Due to the platform being developed in-house, the trading area is unique in it’s look and feel. The type of option available are listed across the top of the trading area in selectable tabs. Once selected, the area below populates the price graph beneath. Traders use drop down lists to select the asset class (commodities, currencies, indices and stocks – stocks are then broken down further by geographical area. If market in an area are closed, those will be greyed out). Once the asset class is selected, trader can use the next list which has the specific assets. The payout and expiry fields will update based on the asset selected – and the expiry time can be amended if desired. Once the appropriate values have been selected, the price graph in the main part of the trading area will update. The scale of the graph can be amended too, with timescales ranging from 5 minute intervals to daily intervals. The trading buttons are positioned to the left of the graph, with very clear green ‘up’ and red ‘down’ arrows. Traders enter the value of the trade in the field between the arrows. The value then updates the investment and return fields automatically, so traders can see the potential winnings. Open trades are then listed below, from here traders can go to use the SellOption if they need or want to. Binary options – The traditional up/down trade. Will the price of an asset rise or fall? Sell Option – The SellOption feature is where traders can end their trade early or “cash in” their position. This enables users to either lock in some profit where a trade is going well, or cut losses where the price has moved against the trader. It is a helpful feature that allows traders maximise profits. 60 seconds – These trades follow the standard binary options pattern, but the expiry times are extremely short, as the name suggests, 60 seconds or less. Daily/Weekly – These follow the same rules as standard binary options, but the expiry times are the close of the markets that day, or the close of markets at the end of the week. Long term – Long term binaries are a growing option among traders who prefer their investments to have enough time to allow the fundamentals to have an impact. Again, they operate just as normal binary options, but with much longer expiry times. From two weeks, to twelve months. At EZtrader, long term options tend to only have one outcome tradeable – not both directions as with other trades. The firm also offer options on forex, commodities, stocks and indices. The main range is stocks. EZtrader offer stock from the US, Eu and Asia. The ranges in other asset classes are not quite as large as some rival brokers, but all the well traded assets are available. EZTrader offer a free trading app to compliment the full website. The EZtrader app is compatible with iOS and android (2.3.3 and up), and has been developed for smartphones and tablets. The entire platform was designed to be cross device and cross browser compatible. This ensures a seamless experience from mobile app to desktop. Ease of use has been at the forefront of the design, to ensure trading is still quick, easy and accurate. All of the 120+ assets that can be traded online, can be traded via the mobile app too. The application is secured with the latest financial mobile technology protocols, and deposits can be made via a number of methods on the EZtrader application. This ensures traders are able to react quickly to changing markets or opportunities. Open trades and the account balance are also both available via the app, as are price alerts and up to date news. The app is slick and efficient and allows genuine trading while out and about. It has also gained favourable reviews from users who have previously downloaded it. (4.0 out of 5.0 from over 800+ reviews). EZTrader typically offers a return of between 72% and 95% on options. This rate can vary depending on the asset and expiry time. For example, long term options might offer returns of well over 400%, depending how far ahead the expiry is placed. EZTrader offer a wide range of deposit methods, though these will vary based on the location of the trader. Options for UK depositors are Credit Cards (Visa, MasterCard, Amex, Diners, Discover), Skrill (also referred to as Moneybookers) and wire transfer. The minimum deposit (for funding a new account) is £200. Withdrawals via EZtrader follow the same pattern as the majority of brokers, in that an account needs to be verified before a withdrawal can be made. This can be done at any time – so it is well worth doing early on. Delays in verification can lead to delays in withdrawals and this is often the source of disputes or disgruntled traders. Verify accounts early to avoid these delays. Once an account is verified, withdrawals can be made via the ‘My Account’ screens. As with all brokers, EZTrader will only allow withdrawals by credit card to reach the same amount as was originally deposited via that card. Any additional profit must be withdrawn via Skrill or wire transfer. This process is the same across all brokers and is a money laundering safeguard. Wire transfer refunds do incur a £15 fee. All withdrawals take roughly 7 days to complete according to EZTrader. This is slower than many rival firms are able to deliver, so it something EZTrader could look to improve. EZPay Meter – A simple meter to show the cash back that will be paid at the next payment date. A good reward for regular traders. Low minimum trades – Just £20 per trade. EZDay – Regular traders earn free bonuses at the start of each month via EZDay. Exclusive Bonus – Deposit £500 and get an Education package worth £5000. Only available through binaryoptions.co.uk.